Is it your first time shopping for a toilet? Or Have you been using another toilet brand and want to try out the Kohler brand toilet? Are you looking for a high-efficient and comfortable toilet? Then, Kohler Persuade Toilet will be an excellent choice for you. There are so many toilets on offer and choosing the best is vital. We understand this, and that’s why we’ve come up with this review to help people like you land the best flushing toilets instead of investing in toilets models that they will regret having invested in. Read this Kohler Persuade toilet review to know more about this toilet. The Kohler 3723-0 Persuade toilet is a high-efficiency toilet with exceptional features. It is easy to install and very comfortable. The two-piece toilet has an elongated bowl design, dual flush technology, skirted trapway design, and a seat height of 16.5”. If you’ve been looking for a toilet to complement your modern bathroom design, then this is the toilet for you. Kohler is a reliable brand and they offer some of the best toilets on the market. Read our detailed review to make an informed decision whether this toilet is good for you or not. But you will definitely love it. 3 Summary: Why buy Kohler Persuade Curv Toilet? Made of Vitreous china material, the Kohler Persuade two-piece toilet will last for over a long period of time. Actually, many previous users of Kohler toilets say that they last for more than 10 years with some having the same toilets for over 20 years. The toilet has a sleek design, which will change the look of your bathroom. Moreover, the toilet has a skirted trapway, which is easy to install by setting up to the floor flange and attaching the toilet, without the need of drilling holes. The toilet will still be stable even without drilling holes, so, there is nothing to worry about such as a wobbly toilet. Before you install the toilet, you will have to purchase the toilet seat and wax ring kit as they are not included in the purchase. Just like many Kohler toilets, the Persuade two-piece toilet is very comfortable. It is of a standard height as it measures 16.5” without a toilet seat. This makes it be ADA compliant and comfortable as well. Additionally, it has an elongated bowl design, which provides more sitting space unlike the round bowl toilet. Using the toilet is fun and easy. This is because it features a dual flush mechanism, which not only saves water but allows the user to pick either a partial flush or a full flush. A partial flush is for clearing liquids, while the partial flush is for clearing solids. This is performed by simply pressing the right button on top of the tank. Apart from that, the Kohler Persuade toilet has a powerful flushing system with a MaP rating of 1000g. This means that it clears contents in one flush and leaves nothing behind. With the Kohler Persuade 3723 – 0 toilet, you will be able to save at least 16, 500 gallons of water per year. Thanks to the dual-flush technology that only uses 1.6 GPF for a full flush and 1 GPF for a partial flush. This makes the toilet to be EPA WaterSense certified and as a result, some users may get rebates in their states. But also, one reduces the water bill and save the environment of water misuse. This high-efficient toilet is also very easy to clean. The powerful flush leaves nothing behind and makes cleaning to be easy. In addition, it has a skirted trapway design which gets rid of the crevices and nooks that have to be scrubbed when cleaning the toilet. Therefore, you cleaning time is also reduced as you don’t have to scrub the trapway. Looking at its wonderful features, it is right to say that the Kohler Persuade two-piece toilet can be a great addition to any contemporary bathroom. 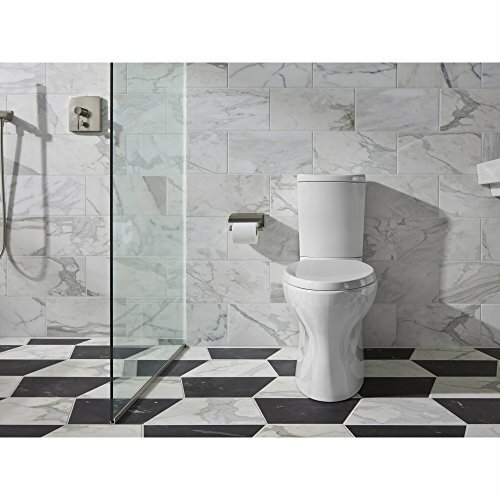 This toilet might be slightly on the high-end when compared to similar toilet models from other brands but it is worth the price. The manufacturer offers a one-year limited warranty and thus you can be sure to get parts replaced if the product comes with a defect or broken part. Summary: Why buy Kohler Persuade Curv Toilet? The Kohler Persuade is not fully AD compliant as it has the trip lever located on the top in form of buttons. 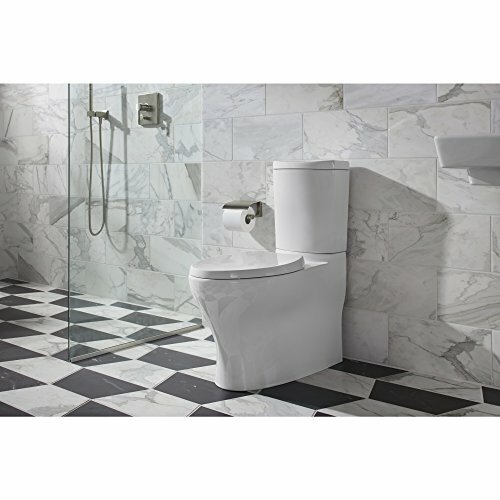 The Kohler K-3723-0 Persuade curv toilet is a perfect addition to any bathroom. Not only does this toilet beautify the bathroom with its sleek and lovely design, but it also performs at a high level. It has a MaP rating of 1000g, which means that it clears waste very efficiently. Additionally, the toilet has a dual flush mechanism, which will enable you to save water in the long run. A few things that the manufacturer could’ve done better are to include a toilet seat and offer a better warranty. Overall, this is an outstanding toilet that is easy to install, clean, and use. Thanks to its comfortable height and two-piece design. Hope you’ve found this Kohler persuade toilet review to be helpful. Question: How does a dual flush toilet work? Answer: A dual flush toilet utilizes a unique flush valve that attains two different flushing functions – one for liquid or partial flush and another for solid or full flush. Instead of the side trip lever flush, the toilet comes with a top mounted button, which is a flush actuator. Normally, the button is made up of two separate valves – one for partial flush and another for full flush. This flush mechanism helps in saving water. Question: Does Kohler offer warranty? Answer: Yes, it does. For instance, the Kohler Persuade toilet comes with a one year warranty. Even though Kohler toilets are durable and highly trusted, the manufacturer should improve on most of its warranties. Question: What is the advantage of a skirted toilet design over the traditional type? Answer: A skirted toilet has its trapway hidden. This type of toilet not only looks beautiful over its traditional type but it is also easy to clean. This is because there are no crevices where dirt and other debris can hide and make cleaning be difficult. Still, have a question after reading this Kohler Persuade toilet review? Comment below.